Hands on: Asus Padfone Infinity review | What Hi-Fi? 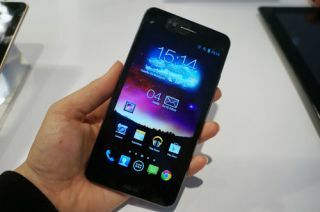 Asus had a lot to get off its chest at MWC 2013. Not only did it announce that the Padfone 2 would finally be coming to the UK (pre-orders start this Friday), but also rather strangely announced its successor as well, the Padfone Infinity. The Padfone Infinity is the latest iteration in the Padfone series - a phone/tablet hybrid that aims to solve the problem of having to fork out a load of cash on two devices. It's a unique proposition really, and one that - thus far - has somehow failed to inspire consumers. Asus is no doubt hoping to change that with the Padfone 2, and the Padfone Infinity carries on the trend of improvement, particularly in the design. After recognising the criticism that Samsung can receive for its plastic designs, Asus said it decided to turn to more premium materials for the Infinity. The phone in the Infinity is made from a single piece of aerospace-grade aluminium and is pretty light at 141g, though it won't bother the iPhone 5 on paper at 112g. A hand-in-hand comparison between the two though didn't show the weight difference quite so obviously, and apparently that's down to the placing of the various components inside that make it feel even lighter than it actually is. The sides of the phone are double anodised to help it to be more durable against knocks and drops and the screen is covered in hardy Corning Gorilla Glass as well. On the top of the phone you'll find a 3.5mm headphone port, and on the right handside there's the volume rocker and lock button. The speaker has also been moved to the right handside, following feedback that speakers on the back in the previous Padfones was not good for sound when the device was laid flat on a surface. The 'Infinity Station' weighs in at 530g, meaning once you've put the phone in it weighs just touch heavier than an iPad 4. The design here is fairly no frills, with the dock in the back, a volume rocker on the left and microUSB charging port on the right. The tablet is ultimately useless without the phone though - all the technical wizardry is in the handset. The PadFone Infinity's handset has a five-inch screen, and so larger than the previous two iterations. It offers a 1920 x 1080 Super IPS screen with 441 pixels per inch, meaning the screen is super sharp and great for consuming video on the go. Click the phone into the Infinity Station on the back and you have access to all your phone's content on its 10.1-inch Super IPS screen. There's no waiting around, all your content from your phone is immediately accessible on the tablet as soon as the phone is docked. If offers a slightly better resolution at 1920 x 1200 but a less impressive pixel density at 244ppi. For the first time, though, the dock offers the same brightness as the phone, at up to 400 nits. The Padfone Infinity rocks Qualcomm's Snapdragon 600 1.7GHz quad-core processor and 2GB of RAM, which Asus says helps towards the phone's "industry-leading" 65ms response time. It certainly felt smooth and lag-free under our fingers, even though Asus told us the software was still around 6 weeks away from being the final version. With all the improvements that have been made, Asus says it should be 25% faster than the Padfone 2, which is no sloth in the first place. It'll be available in a choice of 32GB and 64GB storage options and will come with Android Jelly Bean 4.1.2 on board. The battery in the phone is 2400mAh, which Asus says will offer 19 hours talktime or 9 hours of video. Dock it into the Infinity Station though, and its 5000mAh battery makes all the difference, boosting times up to 57 hours of talktime and 27 hours of video. In fact, the battery on the Infinity Station would be able to recharge your phone twice from flat before needing a recharge itself. There's a power management app that lets you decide how you would like the power to be spread, so you can decide whether to have both devices bear the brunt of the power usage between them, just the tablet or just the phone. As for connectivity, it's wi-fi compatible with 802.11 a/b/g/n and the newest ac standard too, and is 4G ready for those on compatible tariffs. As with previous Padfones, the cellular connectivity from the phone is passed to the tablet when its docked, so you can take your tablet on the go and browse without worrying about tethering, hotspots or the cost of a second tariff. Finally, the Padfone logo on the back of the handset is actually an NFC antenna for quick pairing with other NFC devices and contactless payments. We've seen a number of 13MP phones at MWC 2013 and the Padfone Infinity is another to add to the list, with an impressive f2.0 aperture for improved low-light shots. We took a few quick snaps at Asus' stand with it and it was a fast mover, with colours generally well reproduced, though the whites did lack the punch that an iPhone offers. Video is shot in 1080p, and it gives you the option to carry on taking still images while recording and without interrupting. Sound quality was not something we got to test out on the Padfone Infinity, but we did see an interesting pre-installed app called AudioWizard. Asus developed it with a Grammy-winning company called Waves, giving you different settings based on whether you are playing a game, watching a movie, listening to music or recording audio. Select what's right for purpose and settings will be automatically tweaked to get the best result. As mentioned previously, the phone's speaker has moved onto its side, but the Infinity Station's remains on the back. It's an 18mm speaker - similar to the size of speakers found on a lot of laptops - so we're interested to hear the sound when we get hold of a finished review sample. With the Padfone 2 not even being available over here as yet, this is a bit of a tricky one, but Asus did tell us it was aiming for the summer. As with the Padfone 2, it will be pushing this as a device to be sold on contract, preferably, we were told, at a £36/month price point with a £100 up front cost, or similar. A number of e-tailers will sell it standalone too, but expect it to be pricey - around the £700 mark we'd expect. Of course, it does remove your need to buy two devices, and gives you the freedom to browse on a tablet anywhere, without the need for a second data tariff, which will save you money too. It's an interesting proposition we're sure there's a market for, but the reception of the Padfone 2 will be a testament to that. We'll be reviewing the Padfone 2 shortly, and the Padfone Infinity as soon as we can get out hands on it, so stay tuned to whathifi.com to find out what we thought, and let us know if you like the idea of the Padfone in the comments.